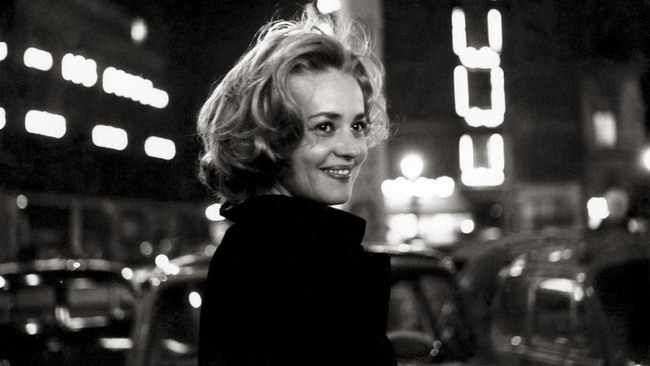 Jeanne Moreau, who appeared in over 130 films over a period of sixty-five years and was declared “the greatest actress in the world” by none other than Orson Welles, has passed away in Paris at the age of eighty-nine. She worked with Jean Gabin in Jacques Becker’s Touchez pas au grisbi (1954), and took the lead in Louis Malle’s Elevator to the Gallows (1958). François Truffaut immortalized her iconic visage in Jules and Jim (1962), and she would work with him again on The Bride Wore Black (1968). She appeared in Michelangelo Antonioni’s La notte (1961), Welles’s The Trial (1962) and Chimes at Midnight (1965), Joseph Losey’s Eva (1962), Jacques Demy’s Bay of Angels (1963), Luis Buñuel’s Diary of a Chambermaid (1964), Rainer Werner Fassbinder’s Querelle (1982), Wim Wenders’s Until the End of the World (1991), François Ozon’s Time to Leave (2005), Tsai Ming-liang’s Face (2009), and Manoel de Oliveira’s Gebo and the Shadow (2012). Among the many awards honoring her work are the Best Actress Award in Cannes for her performance in Peter Brook’s Seven Days... Seven Nights (1960), the BAFTA Award for Best Foreign Actress for Viva Maria! (Malle, 1965), and the César Award for Best Actress for The Old Lady Who Walked in the Sea (Laurent Heynemann, 1992). Moreau was the only actress to have twice chaired the Cannes Film Festival jury, in 1975 and 1995. Moreau’s atypical beauty, what she called “the rings under my eyes and my asymmetrical face,” fitted the young filmmaker’s desire for a more authentic cinema and at the same time a more cerebral type of female eroticism, based on the face rather than the body. Opening [Elevator to the Gallows] with a huge close-up of Moreau’s face, he then proceeded to film her moodily walking the night-time streets of Paris in the rain, to an evocative soundtrack by Miles Davis (she is looking for her lover who has, at her instigation, killed her husband). Their next film The Lovers (Les Amants, 1959) caused an even bigger stir with her “scandalous” representation of female desire (she plays a woman who leaves her husband and daughter for a younger lover). Lift to the Scaffold and The Lovers were a turning point, symbolically erasing her earlier professional background, her previous public image and even her looks. She was “reborn” as a New Wave star. “Coming to the fore during the years of the Nouvelle Vague, Moreau was as integral an element as the jump cut, the Champs Elysees, or the New York Herald Tribune,” writes Adam Batty. The Guardian’s posted an impressive photo gallery. HUO: The connection to literature is strong in your work because there was not only Genet but also Henry Miller, there was Jean Cocteau, there were many . . .
JM: Oh, there was an imbecile, a secretary that destroyed my letters from Cocteau . . .
JM: Well, Henry Miller I met through Anaïs Nin . . .
Film Alert 101 posts remembrances from Peter Kemp, John Conomos, and Michael Campi and Noel Bjorndahl. Gary Meyer recalls seeing her onscreen for the first time when he was around fifteen, catching a glimpse of her in Cannes in 1971 as “she emerged from a party with Louis Malle, Yoko Ono, and John Lennon,” listening to her speak at length in San Francisco in 1974, and then, having co-founded Landmark Films, working with her to distribute L’Adolescente in the U.S.
Andréa R. Vaucher interviewed Moreau for the March/April 1990 issue of Film Comment and revisits the conversation in FC’s latest podcast (36’20”). Update, 9/6: “Moreau, who once declared that “physical beauty is a disgrace,” found in Catherine, and the experimental manner of New Wave filmmaking, an excuse to challenge the notion of how women should look on-screen,” writes Daisy Woodward for AnOther.